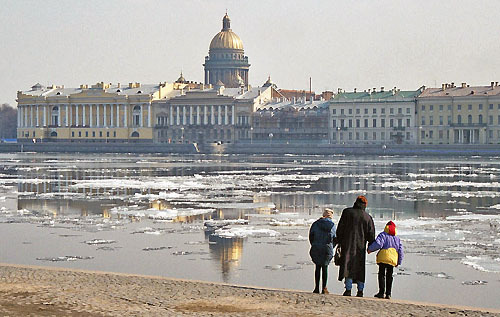 Spring Thaw along the Neva River. Photo courtesy Cynthia Radford. Artistic censorship and repression reached a high point in the Soviet Union in the years between 1946 and 1953. With Stalin's death in the latter year, the bureaucratic fetters were gradually removed from artists and writers, and new themes emerged. Probably the most important literary work of the early post-Stalin years was Ilya Ehrenburg’s The Thaw (1954), the novel that provided a name for the new atmosphere in literature and in Soviet society at large. Ehrenburg, who had always been keenly attuned to what was and what was not publishable, had written something decidedly different from his previous exhortative and anti-Western output. His characters are individuals with personal concerns, and a number of taboo subjects are at least alluded to (anti-Semitism, Stalin's purges, the Doctors’ Plot of 1953, the gulag camp system). Rather than socialist realism, the author’s method might more appropriately be called critical realism. The work first appeared in the May 1954 issue of a literary periodical Znamia (The Banner) that also contained Boris Pasternak’s Zhivago poems. In the fall of 1954, a 45,000-copy edition of the novel sold out in one day. At the same time, a concomitant of the Thaw was commencing, the era of “peaceful coexistence.” In 1947, Stalin had cashiered the prominent economist Evgenii Varga for “revisionist views” that advocated peaceful relations with the West in the post-war era, though Stalin himself would soon adopt a similar line. It was only after Stalin’s death, however, that the general easing of international tensions could occur. The Twentieth congress of the Soviet communist party in February 1956, and Khrushchev’s secret speech to delegates in which he coined the term “cult of personality” to pejoratively describe the Stalin era, provided an enabling clause for both the Thaw and for peaceful coexistence by launching the process of de-Stalinization. In literature, this led to a wave of previously unpublishable works coming to light from the mid-1950s through the early 1960s, as well as to the publication of authors previously interpreted by the censors as anti-Soviet (Westerners like Ernest Hemingway, John Steinbeck, and Jean-Paul Sartre, as well as Russian authors including Mikhail Lermontov and Fedor Dostoevskii). De-Stalinization also had an immediate and deep impact on the Soviet legal system. Forced labor was all but eliminated and the political police were greatly de-emphasized, but no concrete steps were taken to prevent future excesses of the sort that had characterized Stalinism. The difficulties that Khrushchev faced in Poland and Hungary and within the Soviet communist party itself in 1956-57 relegated cultural matters to the background until the award of the 1958 Nobel Prize for literature to Boris Pasternak for Doctor Zhivago. This was a great embarrassment to the Soviets because the novel, unpublished in Russia, had been secreted abroad and published there to great critical acclaim. Nonetheless, Khrushchev remained basically committed to a liberalized policy for authors, while also stressing the need to portray the “positive phenomena” of Soviet society. The high water mark of de-Stalinization was reached in 1961 when the dead leader’s ‘mummy’ was removed from the mausoleum it had shared until then with Lenin’s waxlike cadaver. 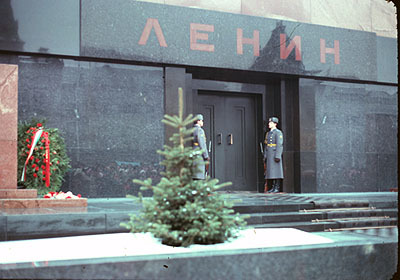 In this atmosphere, Evgenii Yevtushenko was able to publish his poem “Stalin’s Heirs” in the 21 October 1962 issue of the newspaper Pravda, and in a matter of days, Alexander Solzhenitsyn’s novella “One Day in the Life of Ivan Denisovich” appeared in the November issue of the literary monthly Novyi Mir (New World). Yevtushenko’s poem assailed high officials who were biding their time until a return to Stalinism, while Solzhenitsyn’s was the strongest acknowledgment to date of the system of camps known as the "gulag." Both works must have been intended as new salvoes in a renewed “culture war,” but came to mark instead the high tide of the Thaw, which quickly thereafter began to recede. The October 1962 Cuban missile crisis and new challenges within the party to Khrushchev’s authority brought a wholly new atmosphere. In December 1962, Khrushchev denounced all abstract art after visiting a 30-year retrospective of socialist realist painting in the Manege, an exhibition hall that was once a hippodrome. To provoke strong reaction from the Soviet leader, some modernist works (by non-representational artists such as Ernst Neizvestnyi, who with some irony would eventually create Khrushchev’s tomb sculpture) were inserted at the end of the exhibition, and Khrushchev rose to the bait by describing them as looking like excrement flung by infants. In the same month, the Soviet writers’ union attacked Ehrenburg as someone who had thrived under the Stalinist system he later denounced. This was a line of criticism to which Khrushchev himself was vulnerable, and it has been suggested that Ehrenburg was in this case no more than a surrogate for his patron. By 1963, Khrushchev was himself criticizing writers like Ehrenburg and Solzhenitsyn, clearly signaling a cooler climate for creative artists. The end of the Thaw preceded by only a short time the removal of Khrushchev, with whom it was so clearly identified. 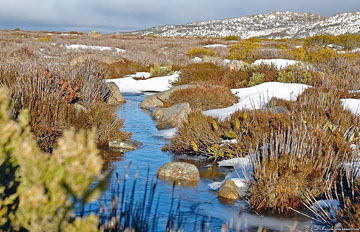 Portions of this essay are adapted from Prof. Blois’ article on “The Thaw” published in The Modern Encyclopedia of Russian and Soviet History (Academic International, 1985) and from chapter 14 (The Thaw) in his Russia and the Soviet Union Since 1861 (University of North Carolina Extension Division, 1973). 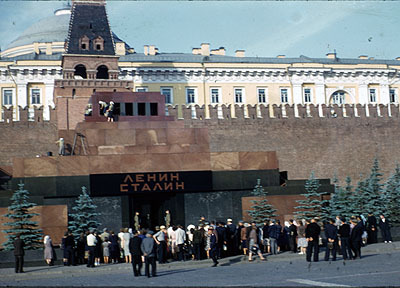 The Lenin-Stalin Mausoleum before 1956 and Khrushchev's "Secret Speech"